Notwithstanding their 40-plus minute presentation, the City of Elk Grove was criticized at last week's meeting of the Sacramento Local Agency Formation Commission (LAFCo) for its plans to enlarge the city. 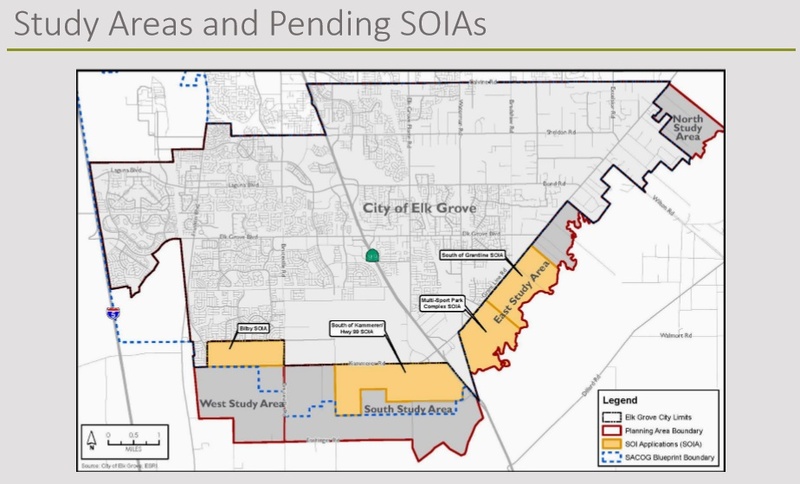 The criticisms, which were made by a variety of interests, condemned Elk Grove's planned expansion through the sphere of influence (SOI) process. The presentation to the LAFCo commission was made by Elk Grove assistant to city manager and planning specialist Christopher Jones at the Wednesday, December 6 meeting. Jordan's presentation, which was as much part history lesson and part public relations pitch, focused on the city's state-mandated general plan update and three current SOI applications, which are the initial steps to annex property. The four SOI applications are for the annexation of approximately 2,915-acres in the southern portion of the city. In a significant setback for housing developers and a stinging rebuke of the Elk Grove City Council, Sacramento LAFCo denied the city's 2013 SOI application that sought to annex approximately 8,000-acres. Of the current SOI applications, one originated from the city and the other two from private developers. Jordan argued in his presentation that the SOI is the initial step for annexation and noted that even if approved, the city still has to annex the property in a process could take up to 20 years before more housing units are constructed. After his presentation, LAFCo board member Gay Jones asked Jordan a host of questions which he vaguely answered. Jordan was asked the water sources for the annexed area, how many rooftops would be added, and about habitat conservation plans. When Jones asked Jordan about low-income housing, he noted that the city has plans to accommodate their allotment from the Sacramento Area Council of Governments. He also said Elk Grove residents have expressed dismay with low-income housing. Jordan did say the City has an allocation of about 3,500 units for very low or low-income residents. "I'll be honest, that low, very low, extremely low income, that's always the challenge," he said. Jordan went to say the City has trouble allocating the 3,500 low-income housing units across that city and that "we almost literally had neighborhoods showing up with pitchforks and torches because of the compatibility issues which are very real concerns." During public comment, the presentation was criticized by three environmentalist, two agriculture interest, and one Elk Grove resident. There were no public comments in favor of Elk Grove's expansion plans. Speaking on behalf of the Mother Lode chapter of the Sierra Club, Sean Wirth noted there was nothing in Jordan's presentations on the effects on the environment. He also opined what environmental documents included in the application were faulty. "If this new SOI is approved outside the urban services boundary, there is going to a general belief that other areas nearby will also be able to be part of this sphere," With said. "It is going to be impossible to conservation in that area affects is going to be way to expensive to buy any other land, any other property." Wirth also noted flooding that occurs every seven to ten years on the southern portions of the city along the Cosumnes River which affect sandhill cranes. When flooding occurs, the cranes flee to higher ground and if the land is developed, they will lose habitat. Speaking for agriculture interests was Bill Bird from the Sacramento Farm Bureau who in part echoed Wirth. Bird said agricultural uses were not taken into account and once the land is annexed, farms will be abandoned for a variety of reasons. "When you consider all three sphere of influence amendments, you are talking about taking roughly 1,800-acres out of agricultural production," he said. "Once these amendments are granted, the writing on the wall for farmers is crystal clear - the message is - GET OUT!" Addressing Elk Grove's performance regarding employment development was resident Lynn Wheat. In her comments Wheat noted there was no mention of the quality of the new jobs developed, the 2,000 promised new jobs should the Wilton Rancheria gain approval of their proposed casino will be low wage hospitality jobs, and that the Elk Grove Unified School District remains the largest employer in the city. Wheat also noted former Mayor Gary Davis' announcement two years ago that NRC Manufacturing, whom he called a large Silicon Valley concern, was locating to Elk Grove. Since that time NRC has not relocated any of their operations to Elk Grove. "A firm from the Bay Area NRC was to come a couple of years ago," Wheat said. "Since it was presented to our city council and spoken about we haven't heard anything, so the joke in our community is N R C stands for not really coming." After receiving the public comments, the board also attended to other business, including the election of a new chair person for 2018. Elk Grove City Council Member Pat Hume, who had been serving as vice chair, was elected chair for 2018. People need to back off! The SOIs HAVE to be approved because that's why we became a city--the County was not going to allow urbanization in those areas. Hey look, there's no money in cows and hay! I say homes is where it's at. The old Elk Grove ag land owners deserve their payout because so they can live high off the hog and their kids don't wanna be farmers anyway! Kudos to our man Hume for getting himself appointed Chair of Lafco! Those tree huggers, bird watchers, casino haters, and water guzzlers need to step aside and let people make money! The bigger Elk Grove becomes, the better! Hey D.J., I hope your sarcasm is not lost on the intelligent, savvy reader. In this voter's opinion, "your man" Pat Hume is on the Elk Grove City Council for two reasons only, the SOI and the Capital Southeast Connector. Since its inception, Hume has been the only Elk Grove City Council representative on the Connector JPA and that is not by accident. And now LAFCo. Jackpot! If Hume gets reelected, it will be his fourth term. Twelve years, let alone 16, is long enough for any one person to be on the Elk Grove City Council along. Coupled with all the "favored" predetermined appointees, an argument could be made that the city council is guilty of inbreeding. At what number does an elected official become a dinosaur? Democracy works best when new people and ideas are brought to the table. Political office should never become a lifetime profession. Go there do your turn and leave. If Darren Suen runs for Mayor and happens to win, don't think for one minute Suen, Hume and Steve Detrick haven't already decided who their appointee is going to be. After all, it has been stated that they "know better than the voters!" This small-minded compulsion toward political incestuousness and routine inbreeding is taking us downhill — fast. The city is stuck in mediocrity. We’ve been held captive long enough to the ambitions of self-serving interests, hubris, and incompetent, unethical leadership. We must get by-district voting, demand more public truth-telling and evolve into a healthy, public-minded, ethically-motivated 21st-century city. EG Voter, my sarcasm is an attempt to sprinkle some yuletide cheer over what is a pretty dismal history of the city. Some may have visions of sugarplums dancing in their heads at this time of year, but for me, I have visions of Region Builders completing our General Plan update; putting together a list of whose been naughty or nice and writing big fat checks to the good; and yes, as you have suggested--figuring out who is going to take Suen's spot when they get him elected as Mayor. Us 'little-people' might be sitting on Santa Builder's lap wishing for District-elections, but in reality, Santa Builder takes a swig of his Christmas schnapps and laughs, with his belly shaking like a bowlful of money!